I usually make sweet potatoes bubur cha cha, a couple of weeks ago, I tried to make them into fritters so that my girls get to eat the sweet potatoes rather than only the soup. 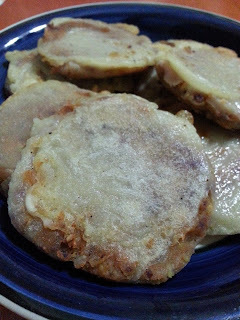 I am glad that my girls like them though the appearance of the fritters do not look yummy, too plain for food presentation, haaa..
We can just take a piece or two for snacking during the afternoon before dinner time. Sweet potatoes is a healthier choice than many other processed food for the children. I agree with you, sweet popatoes are good for health and the taste is good.I enjoyed to see the you tube,Sweet Potatoes Fritters! I love sweet potatoes and bubur cha cha. And fried sweet potatoes fritters too. If only my kids eat them like your kids do....sigh. I have not eaten smashed sweet potato fritters, usually its sliced sweet potato fritters. I think the taste will be the same and less oil to fry. Sweet potatoes always taste good in anything from main dishes to fried fritters and desserts. I love them too and it is cheap.